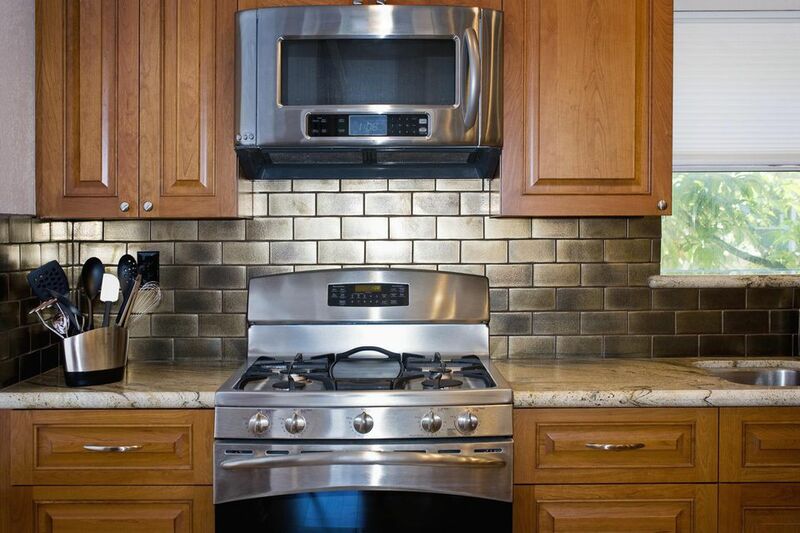 Don't call a handyman or appliance technician to install your over-the-range microwave. Unless installation is part of the purchase price of your microwave, you can install it easily enough with common tools and an extra set of hands. Because the job looks deceptively ugly, let me tell you the only three aspects of this project that are even remotely scary—and why they are not. Surprisingly, the microwave will not fall off the wall. Once you find the studs in the wall, you're 75 percent done. A special metal mounting plate attaches to the stud, and the microwave attaches to the plate. It is virtually impossible for the microwave to fall. This is difficult only if you make it so. True, if you buy a hard-wired microwave, you will need intermediate electrical skills to wire it; it's best to buy a plug-in microwave so you don't have to deal with that. Paper templates temporarily applied to the wall will show you exactly where to drill. You can even drill right through the paper. Mostly likely, you will only need to go out and buy a few tools for installing your over-the-range microwave. None of these tools are very expensive. You'll need to install the over-the-range microwave to studs, not wallboard. Studs are secure; wallboard, while fine for hanging pictures or towel bars, is not. With an electronic stud finder, you can locate the studs with ease. Your microwave should have two paper templates: one for the wall, one for the upper cabinet. Apply the wall template to the wall with masking tape. After applying the template to the wall, you're still not done. There should be a second template that applies to the bottom of the upper cabinet. This template will show you where to drill holes for power cords and venting. The metal mounting plate is the real magic in over-range microwave installation. It's the one piece that carries all the weight. Screw in the mounting plate at the studs. Now it's time for your helper to join you. Place the cord on top of the microwave. Have your helper hold the bulk of the weight while you reach around back and hook the slots to the tabs on the metal mounting plate. Push the power cord up through the hole that you drilled in your upper cabinets. Your microwave's installation kit should come with self-aligning screws. With your partner still steadying the microwave, go above into the upper cabinet and tighten the self-aligning screws with your fingers first. This will allow your partner to let go. Tighten screws the rest of the way with a wrench. If your microwave has a duct, connect it to the duct with duct tape. What Are the Best Places to Install a Chest or Upright Freezer?